A day after BJP MLA and four security personnel were killed in IED blast in Chhattisgarh’s Dantewada district, security forces on Wednesday recovered huge cache of arms and ammunitions from forest patches of Bukmarka Mountains, adjoining Maharashtra, under Manpur police station limits following a fierce encounter with Naxals. The encounter took place at 1:15 pm when security forces raided a Maoist camp in Bukmarka. No casualties were reported from either side in the skirmish. Confirming the incident, Manpur SHO Lomesh Sonwani said four cooker Improvise Explosive Devices (IED) of 5-liter each, one cooker IED of 3-liter, 2 pipe bombs, 3 bundles wire, rocket launcher shell, empty cartridge of AK-47 rifle, banners and daily use materials were recovered from spot. As per information, nearly 90 Special Task Force and District Reserve Guard personnel raided a Naxal camp in Bukmarka. The action of security forces forced Naxals to escape and they triggered three IED blasts to harm security personnel following which a gun battle ensued between Naxals and security forces. Security personnel retaliated and forced Naxals to take the back-foot. Naxals fled towards Gadhchiroli district of Maharashtra. 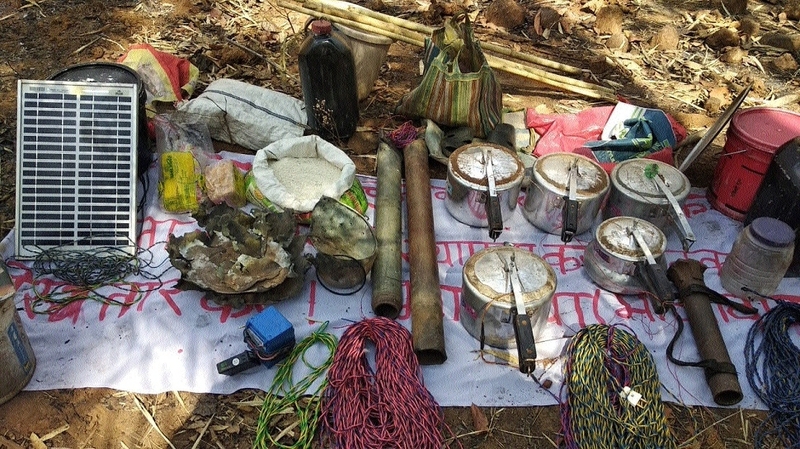 After the guns fell silent, security personnel searched the Naxal camp and recovered arms and ammunitions. Search operations were on till last reports. It may be mentioned that security forces have intensified their search operation in the view of Lok Sabha polls scheduled on April 18 in Rajnandgaon.